My floodplain living up to its name. Perhaps you’ve heard? It’s been raining a lot in my area for the past several weeks. Actually, it’s been pouring — veritable waterfalls from the sky cascading in fat droplets the size of marbles. I’ve lived in this part of North Carolina for well over 50 years. It has never rained like this. Not ever. The local meteorologists back me up on this. They’ve noted record rainfall amounts that triple our “normal” accumulations. Talk about your mixed blessings. The photo above was taken about 9:00 a.m. after a day and night of rain. 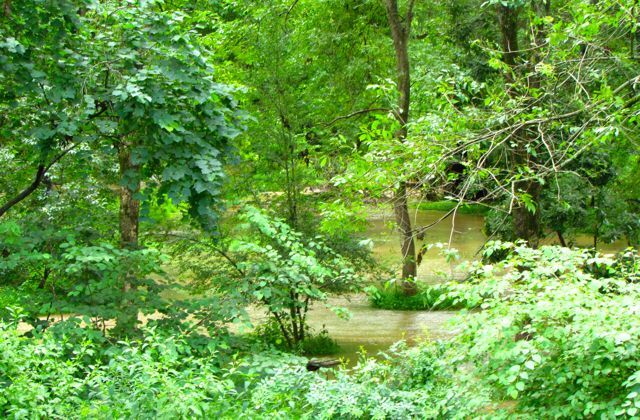 I’ve lost track of how many inches fell, but it was more than enough to push the creek that forms one of our property boundaries out of its banks — in at least a half dozen spots — and onto our floodplain. The bird feeder in the foreground is not quite in the flood. It looks a lot like a raging river, doesn’t it? Muddy water tears by in multiple interweaving currents. But it’s not even the sights you notice when you step outside. The smell assaults you first — mucky, decaying, fungus-filled deep humidity. 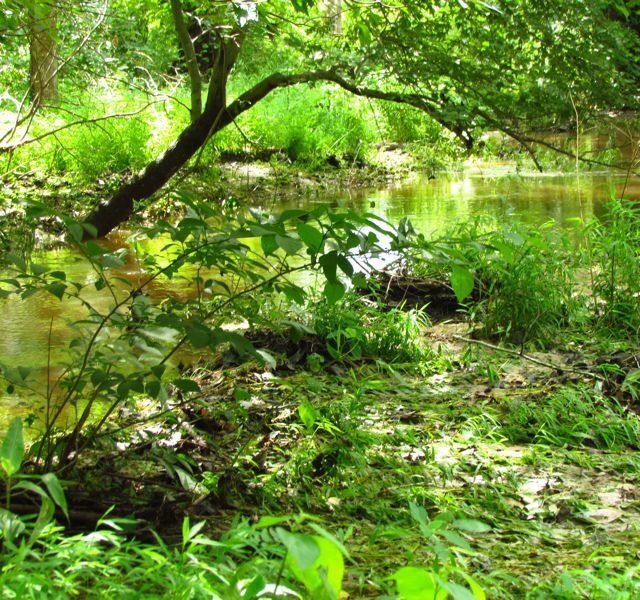 Then you notice the roar of the water as it leaps over the bank of the creek onto the floodplain, currents scouring paths in the silt, carrying fish, driftwood, and assorted bits of trash deep into the swamp, where the currents finally weaken, morphing into a murky pond. We lived on muddy lake-front property for about 18 hours. The creek is the muddy stream in the background. 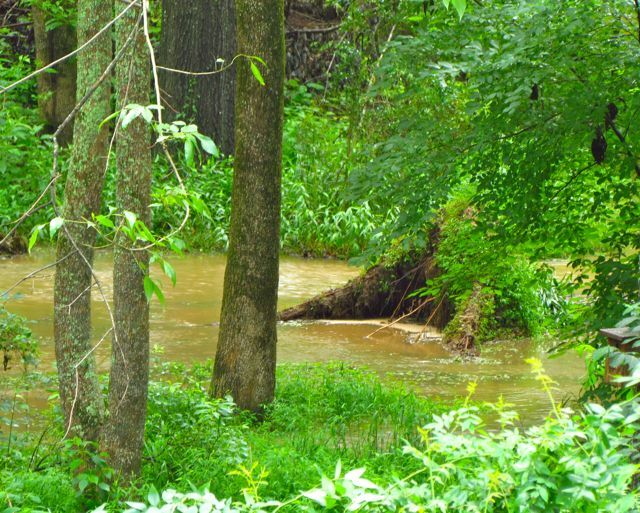 The water in the foreground covers the trail beside the creek, where we usually walk. 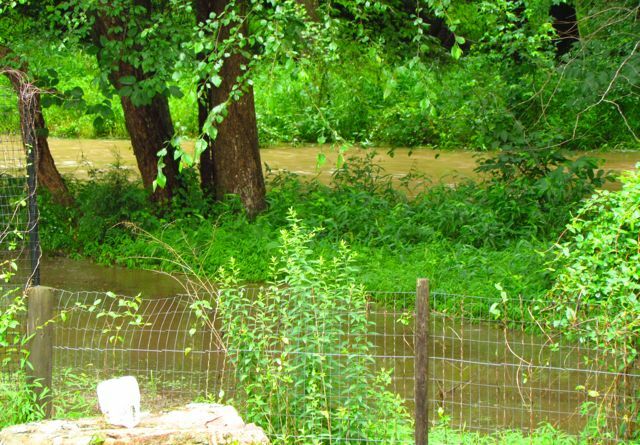 The creek breached the bank further downstream, then back-filled itself up the path, right up to our back fence line. We count ourselves deeply fortunate. Our power was never off for more than a few hours at a time, and we experienced no strong wind gusts during the unrelenting downpour. Our completely saturated ground could not have held the large canopy trees upright, if strong winds had bullied them. We did lose one canopy tree on the floodplain: a large Ash. Its root ball was completely undercut by rushing water. That’s the root ball of the Ash in the middle of the raging current crossing our floodplain. Alas, the Ash fell smack onto my Sweet Bay Magnolia (Magnolia virginiana), which was covered in swelling white flower buds. The Ash sheared off one of the two main branches of the Magnolia. If the mud on the floodplain ever dries up enough for us to walk on, we’ll try to clean up the damage to the Sweet Bay. For now, all we can do is share our sympathies with the maimed Magnolia. 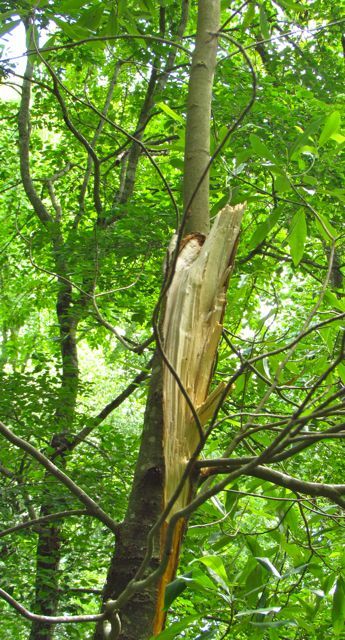 The Ash ripped off one of the trunks of the twin-trunked Sweet Bay Magnolia. 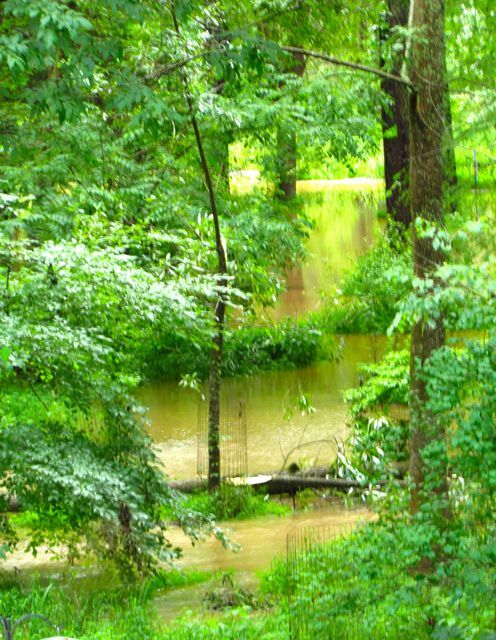 By about 2:00 p.m. on the day I took the above photos, the creek had grudgingly retreated — mostly — back to within its banks, leaving only a few thin streams running across the far southern end of our property beside the swamp. I took a picture to show how it looked. That’s the creek in back, just barely where it’s supposed to be. The foreground shows one of the spots where it overflowed with rushing current, hence the flattened vegetation and the abundant fresh sand/silt deposits. I gave up walking pretty quickly. I was sinking past my ankles in my boots, and it was very difficult to pull myself out — one foot at a time — to move anywhere. I knew if I fell over, the mud might swallow me whole, so I retreated. We’ve had two whole days without rain now, maybe three, but the floodplain is still nothing but mud. Too muddy for Wonder Spouse to try to cut up the fallen Ash and trim up the wounded Sweet Bay Magnolia. He was able to cut up the other tree we lost — a dying Black Cherry at the top of our hill. It simply fell over, pulling down some of our deer fencing that encloses the north side of our yard. The root system was weakened by disease and the ground was wetter than it may have ever been before. Eerily, Wonder Spouse had mentioned to me the week before that he wanted to take down that tree anyway, noting its sickliness. I guess the tree wanted to save him the trouble. The most astonishing thing to me through this crazy wet summer is how the plants and animals have responded. I knew we had been living in varying states of drought for the last 17 or so years, but I hadn’t realized how thirsty the plants were — until I’ve seen how they’ve responded to basically unlimited water. I am almost afraid. Don’t get me wrong, the trees look great. Instead of the raggedy brown look they’ve been sporting most summers by this time, they look nearly as freshly green as they did when they leafed out in April. In recent years, the Tulip Poplar leaves have been turning yellow and dropping by now, their response to insufficient water. Not this year. And, good golly, the weeds. Have mercy, the weeds! As I walk from my front door to the vegetable garden at the top of the hill, I try to look straight ahead, focusing only on the path before me. Because if I look anywhere else, I see flowers struggling in a jungle of Japanese Stilt Grass approaching four feet tall, Pokeweed the height of pro basketball players, Poison Ivy plotting to grab me by the ankles and pull me into the overgrown areas full of ripening blackberries and volunteer tree saplings. The green areas I call lawn are requiring me to mow them (weather permitting) weekly. Usually by now I’m mowing every 6-8 weeks, as the drought forces lawn plants into slow-growing survival mode. The birds are deliriously happy over the abundant wild blackberry supply. And the bugs. Gnats form sky-blackening clouds. Biting flies slam into my hat-covered head like bullets as I traverse the path to the garden. Mosquitoes bite me through my clothes. Ticks dangle hungrily from every blade and branch. It is a bona fide jungle out there, folks. And I am completely outnumbered. Despite the plagues of weeds and bugs, my garden is hanging tough. The tomatoes are finally thinking about ripening. They needed sunlight — a commodity in very short supply these last few weeks. Now it’s a race between the moisture-loving fungal diseases and the ripening of the fruits. I’m not sure which will win yet. I’m still picking squashes daily. Despite the usual bug attacks, the plants are still producing. I think the abundant soil moisture is allowing them to hang tough longer than usual. Ditto for the Fortex pole beans. Never have they produced so abundantly for so long. 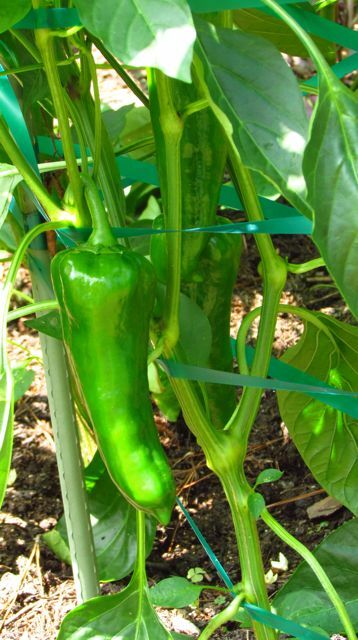 The pepper plants grow heavier with fruit daily, but no signs of ripening yet. Carmen Sweet Italian peppers grow longer each day. In short, for the first time in my gardening life, my vegetables have all the water they could possibly want. 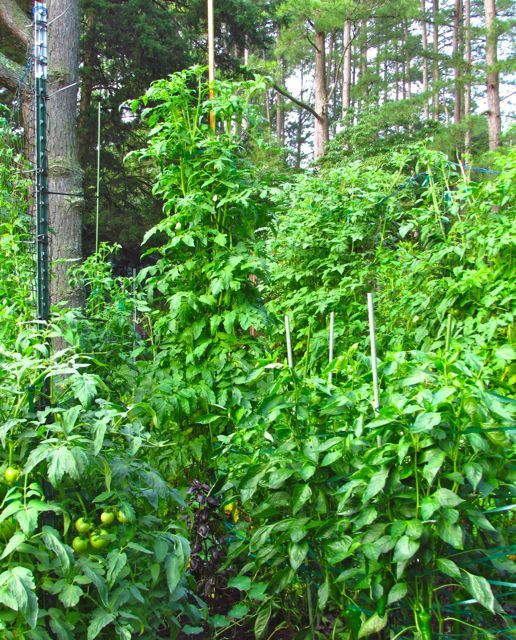 Doing its own jungle imitation, the vegetable garden looked like this on the day I took the flood pictures. As usual, the Sweet Treats cherry tomatoes are ripening first, but we have eaten a few wonderful Bella Rosas, a couple of seed-grown Early Goliath fruits, and a couple of Viva Italias. 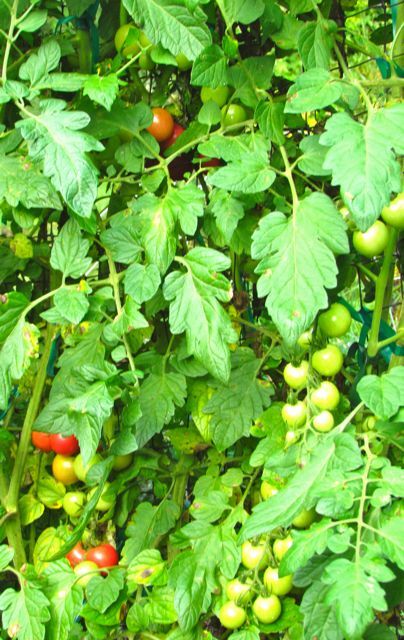 Sweet Treats cherry tomatoes finally developing ripe fruits. I can’t close this too-lengthy post without showing you how my Plumleaf Azalea responded to the abundant water. 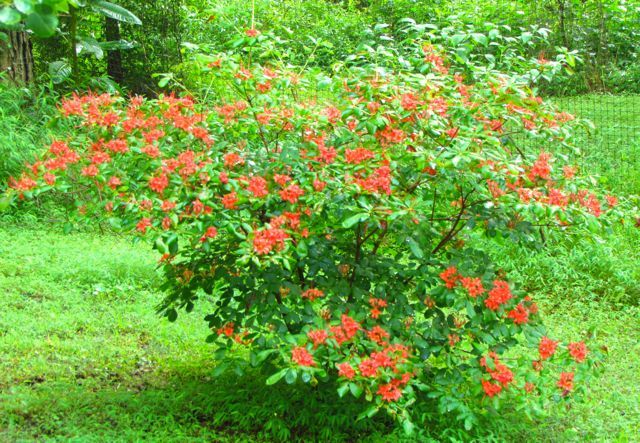 This summer-blooming deciduous azalea is always the Grand Finale to my procession of beautiful azaleas, the effect of its flowers somewhat muted by the presence of leaves. All the others bloom before the leaves emerge in spring. I took these photos last week early in the morning. We had received another three-quarters of an inch of rain the night before, so it was misty outside. Here’s a closer view of the flowers. 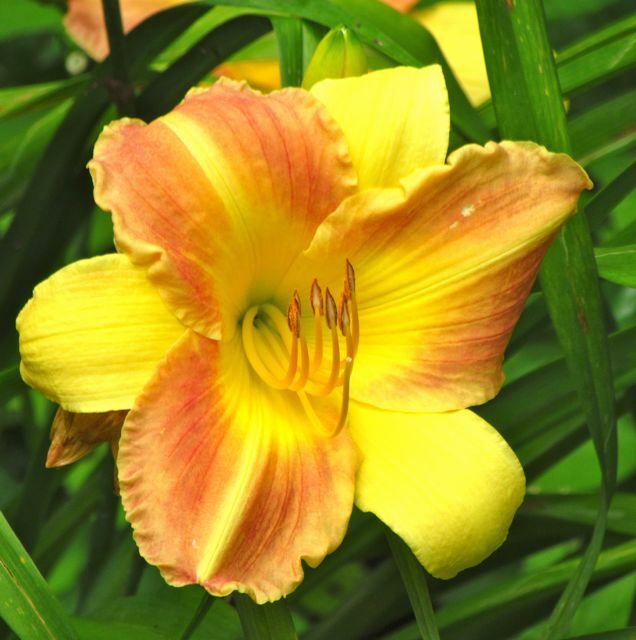 The leaves are a bit damaged, but the flowers more than compensate as far as I’m concerned. 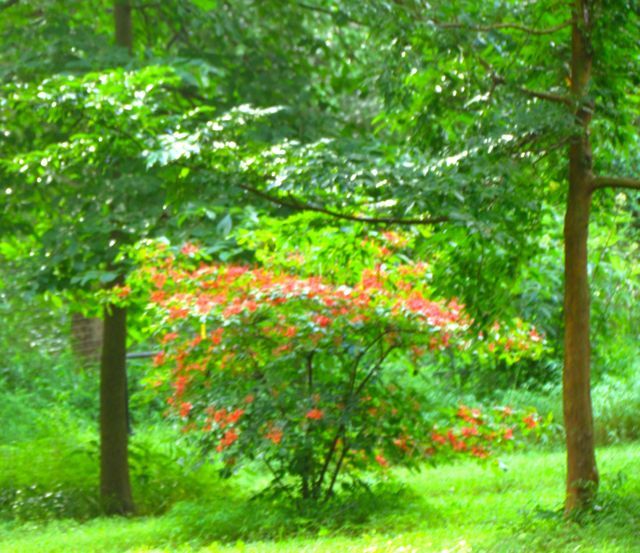 Red flowers contrast with green leaves in a way that always reminds me of Christmas. Finally, I’ll leave you with a fuzzy Monet-esque shot of the Plumleaf Azalea in my landscape. If I had skill with watercolors, I would try to paint this. 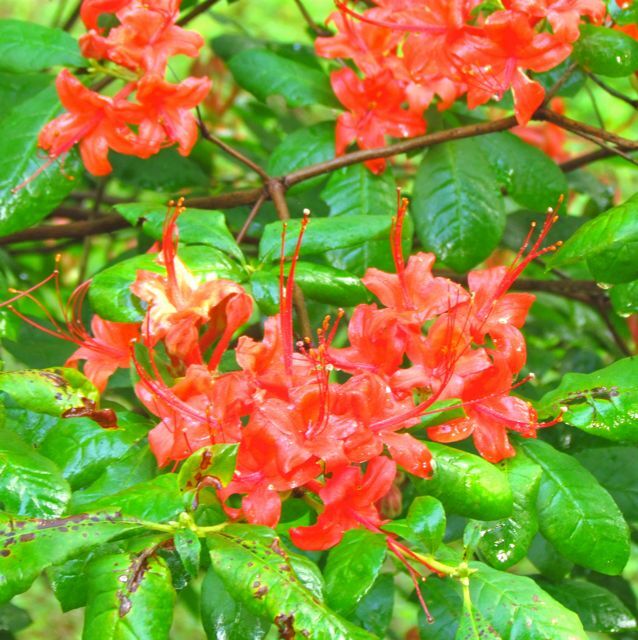 Glowing in the misty landscape, Plumleaf Azalea celebrates the abundant moisture. Here’s hoping the meteorologists are over-estimating the amount of rainfall predicted for this weekend. This entry was posted on July 18, 2013, 1:57 pm and is filed under Favorite Plants, piedmont gardening, Vegetable Gardening. You can follow any responses to this entry through RSS 2.0. You can skip to the end and leave a response. Pinging is currently not allowed. Talk about a deluge! Hoping that all is well with you after yesterday’s storm. 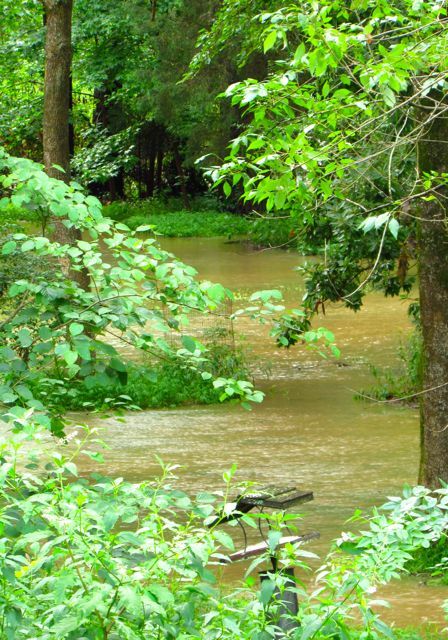 I’m feeling both your joy and your pain, as the creek that runs across the road on the other side of my property overflowed its banks for the first time yesterday. I have a huge and truly gorgeous ashe in my own front yard and can only pray that it remains upright, as it’s just a few steps away from my front door. I never thought a day might come when I’d feel depressed at the sight of lush green, but this rainy, tropical environment is starting to wear on my nerves. As someone on Facebook posted last week, I think my feet are beginning to grow moss! Have you ever read Ray Bradbury’s “All Summer in a Day”? If not, you’ll really appreciate it now! I’m glad you are enjoying my little blog. As for rain yesterday, my yard didn’t get any precipitation yesterday. That’s the nature of thunderstorms, I guess, hit or miss. Regarding Ray Bradbury, I first discovered this wonderful writer when I was a teenager. He remains one of my favorite authors. Thanks for reminding me about this story.